Wife and Mother, and Former Product Junkie that Kicked the Store Bought Shampoo Bottles to the Curb! Dezarae Henderson, MBA, developed a passion for styling hair at the age of twelve. A self proclaimed former “Product Junkie”, she searched for and purchased hair products claiming to tame her natural hair. After years of chemically processing her hair to achieve certain styles and not achieving ideal outcomes, she decided to take matters into her own hands and make natural hair products. to suit her hair's needs. Once she took a more natural approach to caring for her hair, Dezarae has grown healthy hair ever since. 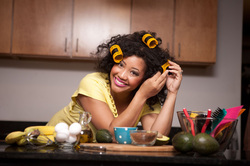 women searching for answers to managing healthy natural hair. Every woman has a little Kitchen Beautician inside of them.